Today my wife was in the hospital for a minor wrist operation — nothing serious or life-threatening, but fixing a condition she’s been living with for a long time. Luckily, the operation went well, and everything seems to be OK. Our dog instantly realized something had changed when she got back, of course, and went up and sniffed her bandaged wrist and hopped into bed next to her. She’s snoozing now with her wrist elevated, with Netflix playing, after we both ate two big bowls of pho. 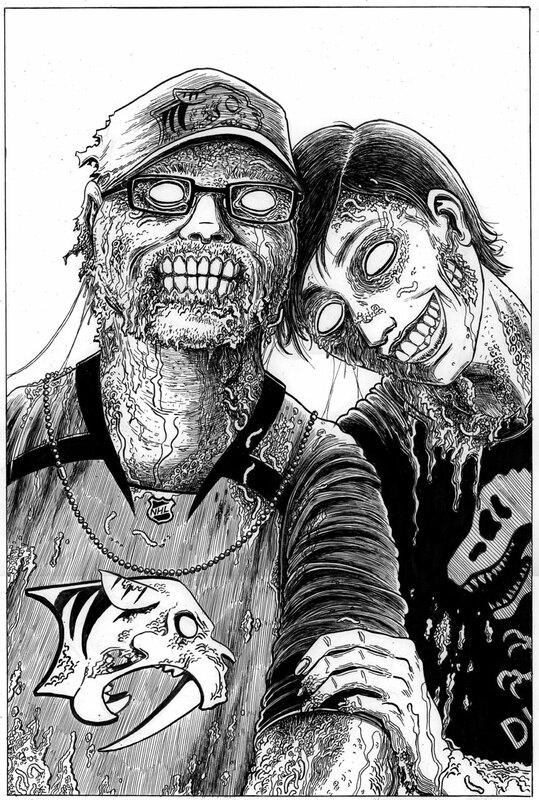 Today’s drawing, of course, is another “Zombie Honeymoon” drawing made for a Map of Zombies supporter! This one was basically copied directly from the photo, with added decay, but I think it turned out pretty well. I wish your wife a speedy recovery. Of course, everything’s better with pho! I’ve never seen a zombified Saber-toothed Tiger before. I am happy your wife is getting fixed. Hope she and you stay well. In “Land of the Dead” we saw two young lovers still together after dying and reanimating. Maybe a little more of their brains are working.